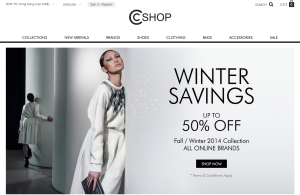 CCSHOP.COM is GRI Group’s state-of-the-art multi-brand online store. The brand new ccshop.com has relaunched! Echoing the poetic and whimsical ambiance of Central Central, its flagship physical store, its online shopping destination brings a vast assemblage of the finest and most up-to-date seasonal items. In addition to online shopping, content such as in store event information and other exciting fashion content is available online. Central Central is the physical flagship store which is located in the heart of downtown Hong Kong and is an artistic and intuitive space tailored to the savvy woman who lives a life in the realm of sophistication and style. GRI Group is Asia’s leading international brand-management and retail-distribution company. Headquartered in Hong Kong, GRI has an extensive multinational network. We are the official Asian Franchisees for world famous brands such as Anne Klein, Carolinna Espinosa, Easy Spirit, EQ:IQ, Jeanne Pierre, Joan & David, Karen Millen, Nine West, Steve Madden. BCNetcom (www.bcnetcom.com) is the leading e-commerce solution provider in Hong Kong and a certified Magento Developer.